We’ve all been there, Christmas is getting really close and the bank account is empty. This year, rather than end up in debt, why not do something different. With a bit of time and effort, you can find a great present for your loved ones without spending too much. 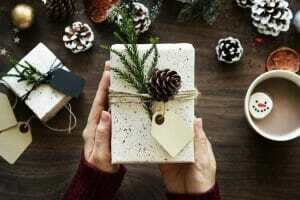 Read on for our top 5 free or cheap gifts at Christmas to get some ideas. Why not make a picture frame full of some up to date photos of the family or a recent special event. You can find nice frames at discount shops but shop around, you should be able to find something for £2-3 that has a picture in already. Buy a sheet of nice card from a shop with discount art supplies like The Range to make a new backing, that shouldn’t cost more than 50p. Sign up to Boots using a special link (google is your friend) and you can get 25 free photo prints for only 99p delivery. You should be able to make 3 photo frames with a bit of imagination for £10! Whether your Dad is into gardening or DIY, gadgets or driving, there is something cheap out there for him. If you have a little bit of money then visit eBay, most products on eBay are new not second hand and are often free delivery. For a gardener, try a new trowel and fork set, they can be bought for as little as 99p with free delivery. They won’t last a lifetime but at 99p they won’t need to. For kids, the pound shops and discount stores are probably the best bet. Toys are no doubt on the list and there are plenty in the discount stores. If they like Lego, there are a lot of lego compatible building block sets for under £5. Dolls and cuddly toys are pretty cheap choices too. Why not ask children to think about selling their old toys on eBay and use the money towards a bigger present? Try eBay again for stocking fillers, there are plenty of really cheap toys. Things like fidget spinners, craft kits and small cuddly toys are under £1. A picture frame is a great choice for a grandparent but what if you’re looking for something else. If you’ve got young kids, why not get them to draw or paint a picture of themselves and then make a frame out of card and bits of tissue paper. If your kids are older, what about making some biscuits with the kids, pack them in a tin or box and wrap nicely. You probably have the ingredients already therefore it’s a nice free present! If your kid’s school does the whole presents thing, there is only one answer, wine. Nearly all teachers struggling with a class of kids at Christmas would appreciate a tipple. Why not see what you have left in the cupboard from last year’s raffle. Maybe you have some rosé that no-one drinks. Give it to the teacher because they’ll appreciate it more than another cheap necklace! We hope our tips help a little in saving you from needing a cash loan at Christmas.